We are the best-known manufacturer and exporter of the high-quality Chandraprabha Vati. This is a very good traditional Ayurvedic medicine for Urinary tract disorders. Chandraprabha Vati is multipurpose & multibeneficial Ayurvedic formulation. 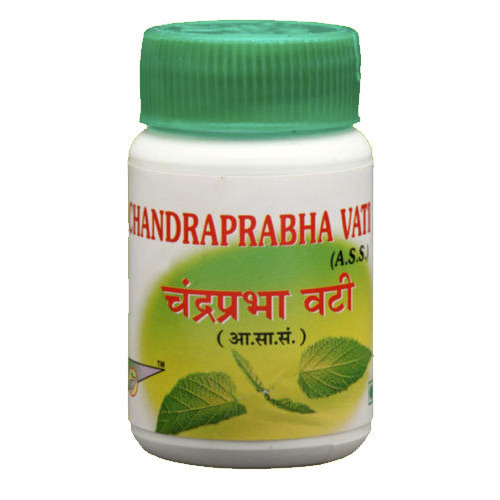 Chandraprabha Vati is useful in Diabetes, Urinary tract infection, Reduce Burning, Spermatorrhea, Leucorrhea, Infertility, Poly urea, Backache, General debility, Urinary calculus, irregular Menstruation, Piles and much more. Regular use of Chandraprabha Vati, particularly Diabetic Patients, keeps them healthy, prevents the body from major illness and keeps Kidneys healthy. Increases Energy and nourishes body cell. Chandraprabha Vati is good for eye site conjunctivitis and other eye problems.